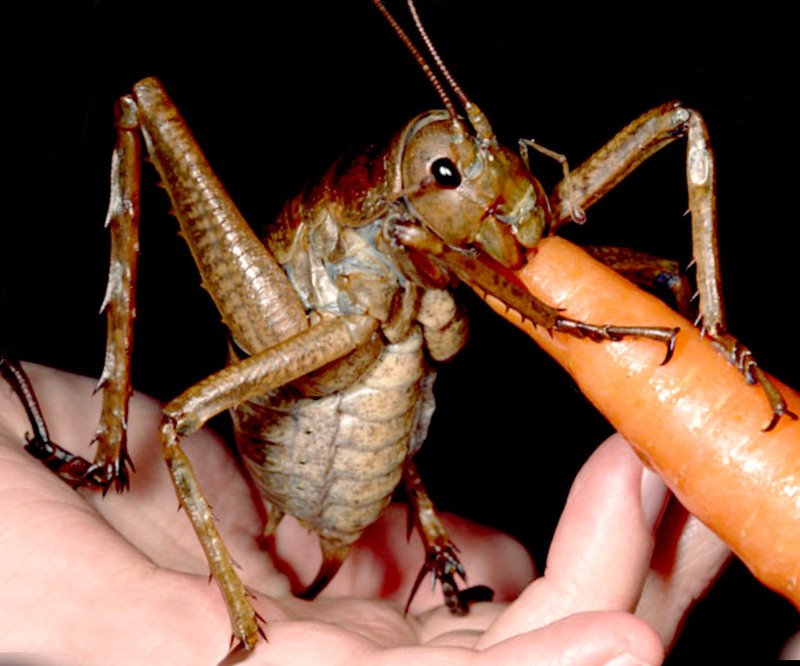 Is the Largest Bug in the World the New Zealand Giant Weta? This extremely rare and endangered insect was found by Mark Moffett. It took him 2 days to find this Giant Weta. She was found on Little Barrier Island, in New Zealand. They are no longer on the main land as they were cleared out by rats brought in by the Europeans. Mark, a bug lover from Colorado, was excited to find this rare cricket-like creature. He was even more honored when it was declared the Largest Insect on Record, according to weight. The wing span is 7 inches. The Largest Bug in the world is debatable. The Goliath Beetle, wing span 10 inches, and the White Witch Moth, wing span 12 inches, may scoff at this claim. But for now, the bug world and the news is eating up this story, and perhaps it is the Largest RECORDED bug in the world. the vicinity in an orderly fashion. 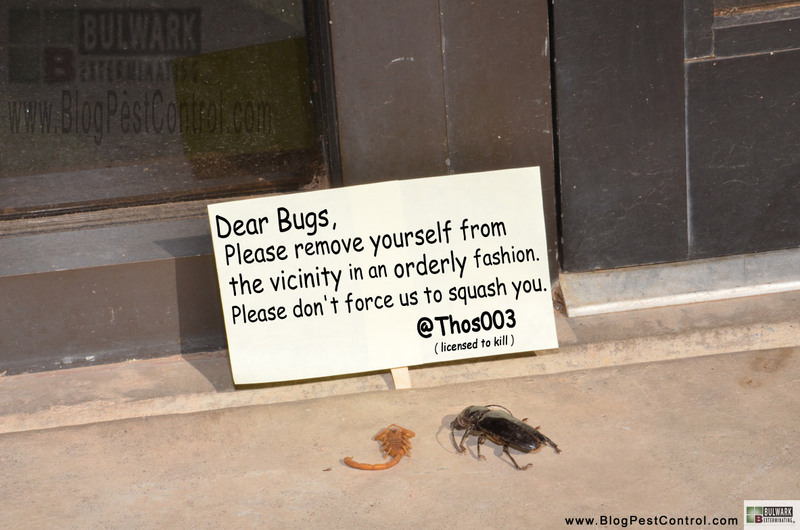 Please don’t force us to squash you. Holistic pest control? Yes. Effective? No. Please tell me which you like better. Thanks! Ants are an increasing problem in many US cities. The weather fluctuations often cause short bursts of ant problems. 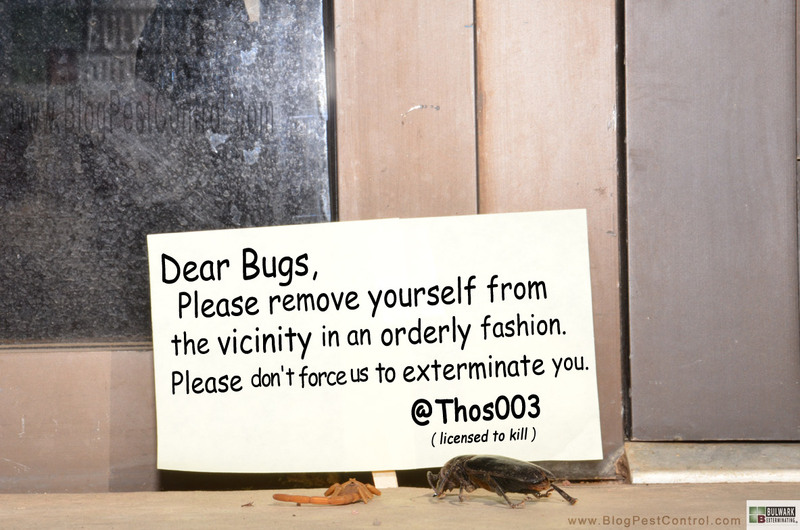 But beyond weather, there are also many new threats on the ant scene. Rasberry Ants have introduced a whole new level of terror as they spread like a plague across Texas and into other Southern states. Argentine ants continue to build their family ties. They are a family of ants that do not compete with each other, thus the family that stays together conquers the world together. And most ant problems are made worse when they are attacked by poorly equipped homeowners. An ant colony will bud, spread out, and bunker down when the colony is attacked. Often, homeowners believe they have been successful with their can of bug spray because the ants will disappear for a time. Well they may disappear but they are not gone. Even if you killed off every ant you saw, the bulk of the ant colony will remain safe and out of fire. Only 20% of the ant colony every leaves at a time. So the would be do-it-yourself pest controller kills off some of the forgers. The colony goes into submission. Rebuilds. And one month later the home owners beloved house is invaded again, by the same colony. Yes. Ant control is usually best left to the professionals. Who do you use for Pest Control? Bulwark Exterminating released it’s most recent customer survey scores. Bulwark sends out surveys to each and everyone of their active customers each year. The cost to survey their customers is not cheap, but the value gained by listening to the customers is well worth it. Being Okay isn’t good enough. When an associate of your customer asks your customer, “Who do you use for Pest Control?” You don’t want to be the company that is just OKAY. You want to be the company that get’s. “I use Joe’s Pest Control. They are Great!” That is really marketing. I recently attended an SEO class that talked about “selling the dream.” The premise was that the content you write should be geared toward the driving motivating desired outcome the client has. “Sell the dream”, was showing them the dream situation that your product or service creates. So the pest control dream, is…. “A pest free home.”, “A bug free Life.”, “A scorpion seal to keep scorpions out.”, “Never see another bug inside your home.” …. really there’s not much more to say. People want pest control because they want to get rid of bugs. Honestly, some of these other “Dream” things were pretty far fetched for me. Like selling the “Win a date with this internet super model”…. Yikes. People actually buy into that? I personally am extremely annoyed by the newspaper advertised price for a new car, a car that never seems to exist on the lot because it was model 871XXX_BUG-ME&NOTreal1 and it was already sold… “Buy this gadget and never lose your keys again.” … unless you lose the gadget. “Never get caught by a photo radar ticket.” That one is a little more appealing to me. I hope that I am not embarrassing you with this mail because you did not expect it or know me before. But kindly rest assured that I have irresistible urge to write it believe me, the mail is an indication of love for you and happiness I shall always wish you. I am Miss Martha. K. Pierre 20 years old and the only daughter and child of late Mr. and Mrs. Ferdinand. K. Pierre the former diamond merchant in Guinea Conakry. My late father was a wealthy Gold and diamond dealer my mother died ten years ago and my father was poisoned to death by his political members, before his death my father told me that he made me the next of kin of a fund he deposited in his offshore account with a financial institution in the Commonwealth of Dominica. I have contacted the bank and confirm that my father really make me the next kin of the deposit, now I want you to assist me to transfer the money into your account in your country because the people that killed my father is after my life now to make sure that our family are drastically wiped off, infarct as I am writing to you now I am in hiding here please if you can help to save my life and transfer the fund to your account. I am deeply interested to offer to you 25% from the total money that is involved for transferring it into your own designated account, again I will hand this money over to you to invest it wisely for me, as you know, this is the highest confidence and trust any person can repose on the other especially when it is considered that we did not know ourselves before then you are expected to display high degree of maturity, responsibility, and understanding in handling this information so that our family enemies will not know that I am getting around in me through your information. The main aim of contact you are to assist me in three ways (1) to help and transfer the money to your country (2) and to help me get a profitable business for investment in overseas any where all is based on your professional advice and acceptance to assist me. (3) To help me have a stay in your country when I might come over to meet with you and continue my education (4) to help me manage whatever investment you will get for me until I finish my education. I will give you every detail about the deposit for the transfer to carry on to your account. After you have indicated your interest and willingness to help me out of this problem to secure the money for a proper investment in your country. Please write to me as fast as to acknowledge this mail and thanks in anticipation. For the confidentiality of this transaction please strictly reply me at XXXXXX@XXXXXXX.com, for scurity porpourse thanks. Remain In Bless the Lord. 2-Appeal to emotion– “irresistible urge”,”indication of love”, “happiness”. Wow lay that on thick! 3- The story– Everyone loves stories. 4- The benefits – What’s in it for me?… Gold, wealth, a young woman. What about the dream? The whole thing was a dream and the perfect guy dream at that…. Wealthy 20 year old in love with you, pleading for you to save her. What man could resist? Well that was great. They almost made it through a perfect pitch… minus the few misspelled words at the end and possibly because it’s “Too Good to be True.” Therein lies a very thin line. When are you overselling? Where is that line? To be continued in Part 2 next week….or next month. What does that have to with pest control? Just got through reading a post on marketing and they questioned the use of facebook and twitter. I agree, similar to my previous post there is a lot of hype about SEO tools and SEO stuff all of which is bugging me, because its like the emperor’s new clothes a bunch of hype with no fabric to it. Or this year’s big “Green Washing” marketing tactic. For many its a pitch. No substance to it. Good business is good business. Good marketing on the other hand…. What you do with the tool is what makes the difference. You can use a hammer to build a building or use the same hammer to bring a building down. If you can combine good business with good marketing then you’ve got a two punch combo worth talking about. That’s where SEO comes to into play. There is no sense pushing a product that does not carry its weight in gold. Pushing products that don’t give a customer what they want is a short term mentality. Its a losing game plan. But adding a little push to a product or service, like Bulwark’s pest control service, that already has momentum, well then you are just fueling the fire. And big fires get noticed. So start by building a good service, find under served customers, ask them what’s bugging them, and then fix it. Create a solution to someone’s problem. See a need, fill a need. Green Week = Green Pest Control? After Green week there has been a lot of buzz on Green Pest Control. Jump on the band wagon before it leaves town… What’s that? What is Green Pest Control? Well unfortunately nobody knows, but for many of the proponents at the Green Pest Management Conference in Dallas, Green is the color of money. But they warn not to participate in “GREEN WASHING”. They say be real about your efforts to offer a Green Pest Control Solution. Despite the fact that there is no solid ground under such claims. But, the good news is that there is hope for a greener pest control future. With this big green wave that hits every year, more and more pest control operators are starting to move toward friendlier solutions. Just the mere fact that they had so many show up for the conference is a step in the right direction. Hopefully those that attended don’t take the green as in say what you want and get more “Green” from the customers. The best Green Practice? – Do what is best for the customer with the least amount of exposure or risk to them and the environment. Don’t take the easy road and just blanket a home with unnessesary products. In my humble opinion, a well placed product can be much more effective then a mine-field of products. And whatever you do, don’t just blanket yourself green when it doesn’t mean a thing to you!